Why do we hang horseshoes for good luck or place wreaths on our doors? Why does the groom carry his new bride over the threshold? These customs represent the last vestiges from a long, rich history of honoring the spirits of our homes. They show that a house is more than a building: it is a living being with a body and soul. Examining the extensive traditions surrounding houses from medieval times to the present, Claude Lecouteux reveals that, before we entered the current era of frequent moves and modular housing, moving largely from the countryside into cities, humanity had an extremely sacred relationship with their homes and all the spirits who lived there alongside them--from the spirit of the house itself to the mischievous elves, fairies, and imps who visited, invited or not. He shows how every aspect of constructing and keeping a house involved rites, ceremony, customs, and taboos to appease the spirits, including the choice of a building lot and the very materials with which it was built. Uncovering the lost meaning behind door and window placement, the hearth, and the threshold, Lecouteux shares many tales of house spirits, from the offerings used to cajole the local land spirit into becoming the domestic house spirit to the good and bad luck bestowed upon those who seek the help of the “Little Money Man.” He draws on studies and classic literature from old Europe--from Celtic lands and Scandinavia to France and Germany to the far eastern borders of Europe and into Russia--to explain the pagan roots behind many of these traditions. 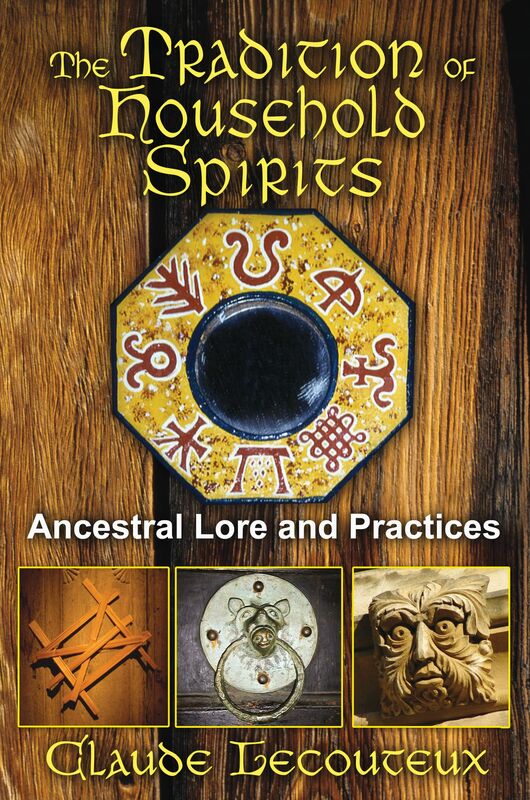 Revealing our ancestors’ charms, prayers, and practices to bestow happiness and prosperity upon their homes, Lecouteux shows that we can invite the spirits back into our houses, old or new, and restore the sacred bond between home and inhabitant. There is a bond between certain spirits and the former deities of paganism. While in some cases, the genii domestici seem to be hypostases of gods and goddesses of the type we find in classical antiquity, in other cases, the creatures under study could be regarded as avatars of the gods, their secularized forms. It is not rare to see that the genius domesticus does not live squarely inside the house but in the kitchen, garden or yard, or actually the hedge, which forms the boundary of the domestic space, the farm or house, or even in a tree or stone that stands in the yard. Perhaps what we are holding here is the intermediary stage preceding the spirit’s move into the heart of the house . . .
How does a home, whether a single dwelling or farm, acquire a spirit that will protect it? This question, which was posed repeatedly by the ethnologists performing the major studies of the first half of the twentieth century, was answered in a variety of ways by the peasants they interrogated. Every answer was equally intriguing because they allowed a fundamental opinion to emerge, one that connected the spirit to a dead person. Martti Haavo’s research in Finland gives us a good overview of the basic explanations. The spirit is the one that lights the fire for the first time in the new house, who is the first to have arrived on the construction site and cleared it, or else the first inhabitant of the land and has died. In Angermanland, a province in the northern part of Sweden, as well as other regions on both shores of the Baltic Sea, this may be a topical spirit that has been tamed, so to speak, thanks to a building, sacrifice, or gift, an offering that represents in fact the purchase price of the land and thus the execution of a tacit contract between the man taking possession of it and the spirit. The offering is placed beneath the threshold, beneath the floor, in a corner, between two specific beams, and so forth; whatever spot is believed to be where the spirit, who apparently retains his property and management rights, stays, being the bare owner, whereas the new resident is merely the usufructer of the premises. The spirit dwells wherever he pleases in the house, in one or more places where the farmer does not enjoy the rights of usufruct, and if someone sleeps there he will wake them up and force them to change place, even going so far as to transform into a cat-shaped nightmare. In the French Alps, the spirit is born from rooster’s egg hatched in the manure of a horse, or from a placenta that a cat has eaten. It is also said to be a wandering spirit that never received baptism, the souls of dead infants who were never baptized, but another explanation maintains that it can be purchased or obtained from the devil. “In order to procure a little devil, you must proceed to the crossing of five paths with a black chicken, say a special prayer, and devote oneself to the devil for a year’s time.” “Little Devil” is only one of the many names of the spirit in Isère. The same thing is said in Latvia about the pukis: one has to sell his soul to the devil or the double--alter ego, outside soul--of an evil individual. In the Riga area, it is said to be obtainable in return for cold cash. The Alpine Servan buys, sells, or sends it, and the same notion is found in Germany where it is also said it must be invited ritually. A peasant once lived near a dike in the Marsch of Hattsted (Schleswig-Holstein), a Frison named Harro Harrsen. . . . He was a clever lad who knew how to get the most out of any situation. On seeing a cavity in an oak column, he told himself it would make a perfect lodging for a little Niskepuk. When his house was built, he nailed beneath this hole a board as wide as his hand for a border. On this he placed a bowl filled with liberally buttered gruel and softly called out, “Come here, kind Niskepuk!” They were not long in coming to examine the new building. They danced through the new home and one of them--three inches tall--remained, and settled in the hole in the column. Among the Sami, the Halde is often hereditary in some families, but it can also be purchased. Here is how the “birth” of a household spirit is described in Angermanland: “When construction on a house is begun, a wooden cross is erected at which point the spirit is born; the cross is left standing until the walls are raised then it is pulled down and chopped into smaller pieces.” In Russia every inhabited house has a spirit called domovoj, who is often the first person to have died there. German traditions, extensively studied by Erika Lindig, provide us details we cannot afford to overlook. Often spirits seek to be hired by the master of the house exactly as would a farmhand or day worker, but the mistrust of men sometimes obliges them to resort to ruse. To enter the house, they change into a harmless object and wait by the edge of the road for someone to pick them up and carry them. This tradition therefore shows that a house cannot be entered a priori without having been invited or brought there. This clearly shows that the dwelling is a sacred space that stands firm against the intrusion of supernatural beings.